A new innovation from Buildex® AutoTeks® is a complete system of both tool and fasteners designed for the easy fastening of metal roofing profiles. The current way of roof fastening is an exhausting process, placing a strain on the roofers back. AutoTeks® is a new innovation from Buildex®, a complete system designed to substantially decrease fatigue and increase efficiency, eliminating OHS&E claims. 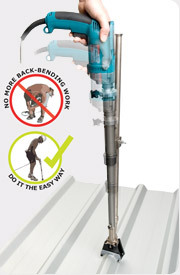 The upright drilling position promotes a more efficient, work practice, allowing roofers to work at the same speed, but for a substantially longer period. seals and overdriving of screws. Easy setup and use for “unskilled” labour. Simple operation, a novice user can be up to full speed in minutes. Accurate depth adjustment reduces dimpling under screw. Buildex® AutoTeks® Fasteners are fed through this convenient loading chute. Correct height adjustment first time everytime. both square-rib and corrugated roofing profiles. Automatically centres screws on roof profile. Only the specially designed Buildex Autoteks® Fasteners can be used with the Autoteks® Tool Assembly. They can however, also be used with standard drill guns. that delivers greatly improved drill performance, particularly in lapped purlins. All AutoTeks® Fasteners are easily recognisable by the “BXA4” marking on the screw head. 1. Connect tool to power source. 2. Drop ONE screw* point down into funnel. 3. Push tool downward until it contacts the roof panel. 4. Engage trigger and continue to push tool downward until screw is fastened. 5. Depth Adjustment Adjustment is made using the large ring located on the upper tool assembly. Rotating the ring closer to the screwgun will make the screw seat tighter to the roof panel. Buildex® AutoTeks® Fasteners ONLY. Failure to use Buildex® fasteners will result in tool jamming and failure to install fasteners. For valley fixing roofing and cladding profiles to steel purlins. For fastening square-rib roofing profiles to steel purlins up to 4.5mm thick. 50mm in length to accommodate thicker insulation blanket. Head painted colours on request minimum order quantity will apply.